It’s been three months since the previous “state of JSON API” blog post, where we explained why JSON API didn’t get into Drupal 8.6 core. We’re now much closer to getting JSON API into Drupal core! includes are now 3 times faster, 4xx responses are now cached! ~75% of the open issues are feature requests! ~200 sites using the beta! Also new: JSON API Extras 2.10, works with JSON API 1.x & 2.x! So … now is the time to update to 2.0-RC1! The response rate for this module has always been very good, thanks to original maintainer Mateu “e0ipso” Aguiló Bosch working on it quite a lot in his sparse free time. (And some company time — thanks Lullabot!) But there’s of course a limit to how much of your free time you can contribute to open source. The primary objective for Gabe and I for most of 2018 has been to get JSON API ready to move into Drupal core. We scrutinized every area of the existing JSON API module, filed lots of issues, minimized the API surface, maximized spec compliance (hence also minimizing Drupalisms), minimized potential for regressions to occur, and so on. This explains the significantly elevated rate of the new issues sparkline. It also explains why the open bugs sparkline first increased. This being our primary objective also explains the response rate sparkline being at 100% nearly continously. It also explains the plummeted average first response time: it went from days to hours! This surely benefited the sites using JSON API: bug fixes happened much faster. 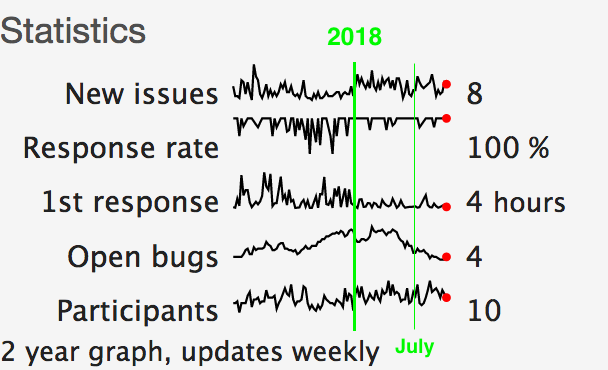 By the end of June, we managed to make the 1.x branch maximally stable and mature in the 1.22 release (shortly before the second green vertical line) — hence the “open bugs” sparkline decreased). The remaining problems required BC breaks — usually minor ones, but BC breaks nonetheless! The version of JSON API that ends up in core needs to be as future proof as possible: BC breaks are not acceptable in core. 2 Hence the need for a 2.x branch. Surely the increased development rate has helped JSON API reached a strong level of stability and maturity faster, and I believe this is also reflected in its adoption: a 50–70 percent increase since the end of 2017! This was the first time I’ve worked so closely and so actively on a small codebase in an open-source setting. I’ve learned some things. Some of you might understandably think that Gabe and I steamrolled this module. But Mateu is still very actively involved, and every significant change still requires his blessing. Funded contributions have accelerated this module’s development, but neither Acquia nor Lullabot ever put any pressure on how it should evolve. It’s always been the module maintainers, through debate (and sometimes heartfelt concessions), who have moved this module forward. The “participants” sparkline being at a slightly higher level than before (with more consistency!) speaks for itself. Probably more importantly: if you’re wondering how the original maintainer Mateu feels about this, I’ll be perfectly honest: it’s been frustrating at times for him — but so it’s been for Gabe and I — for everybody! Differences in availability, opinion, priorities (and private life circumstances!) all have effects. When we disagree, we meet face to face to chat about it openly. Thanks to Mateu & Gabe for their feedback while writing this! JSON API project statistics, annotated with an indicator for the start of 2018 and the time of the previous blog post.